A traditionally Cycladic establishment on the idyllic island of Santorini. 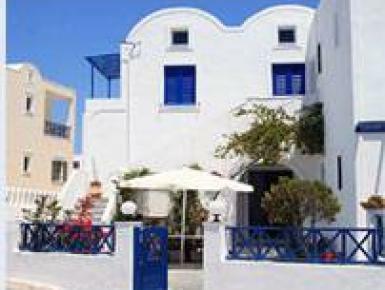 Although it is located in Fira city center, the actual position of the hotel is surprisingly quiet and almost residential. If you walk out the front door, you will find yourself at the beginning of the quaint pathway that winds along the Caldera cliffs towards the shopping center, nightlife, restaurants, cafes and museums. The rooms are equipped with every convenience to guarantee a memorable vacation. The property has recently undergone a complete renovation. The building complex provides Superior Studios on the first & second floors. The Standard Studios and Apartments are located at pool level. Minimal design, simple lines and a varied use of materials such as wood and marble, blend perfectly to create an elegant place of dwelling.